Probate Checklist | The Ashmore Law Firm, P.C. ?I’ve been named executor under a Will, what kind of attorney do I need? ?What is a Primary Beneficiary? Probate Checklist There are a number of documents that are needed to settle your loved one’s estate. 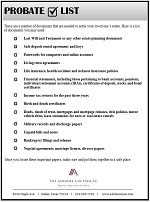 Our probate checklist includes the most important documents you may need. The probate process in Texas can be very time consuming and emotionally draining. To help streamline the process, we have compiled a checklist that includes the most important items that you should have before filing for probate. Click below for a PDF version of our checklist.